The Execution of Noa P. Singleton focuses on Noa, a female inmate awaiting her execution date for the killing of Sarah Dixon ten years prior. Sarah’s mother Marlene shows up with Oliver, a lawyer who, together, think they can get clemency for Noa because apparently Marlene doesn’t believe in the death penalty anymore, she just wants answers. There was so much useless information and all these big words that felt like they were just dumped into a paragraph for show. I will say that I enjoyed the interactions in the beginning with Noa and her father, as they were starting to get to know each other. I wish I felt like I could power through and finish this book, but there are so many great books awaiting me that I can’t waste my time on something I’m not in to. Have you read The Execution of Noa P. Singleton? Let me know what you thought! I’d had this book on my Goodreads TBR for several months before Nabille asked if I would like to review it…so of course I was super excited because it sounded so good! The book is about a virtual world called Lumen, and a world called Zero where it’s citizens must deal with radiation in the air while they try to survive. In order to be lucky enough to live in Lumen, participants must complete 4 zones in The Passage. You can either complete all 4 tests successfully and live in Lumen, go to university, etc., females can be purchased by a man before having a chance to fail in The Passage, or, die. Kino, the main character, has trained for this moment her entire life. She doesn’t really want to be bought by a man, but sometimes, that’s the only means of surviving. While reading this I felt it reminded me of The Hunger Games and I book I recently finished called Elusion. It reminded me of THG because everyone is fighting to be the winner, and Elusion because that novel focuses on a virtual reality as well. I felt the way Nabille portrayed Kino’s teammates was excellent. I got a sense of connection and understanding with each of her friends as a whole, and individuals. I would like to see more of Axel’s background fleshed out in the following book. I really liked Neal’s character, and the interactions between Neal and Kino! This novel of course had errors and repetitive passages, but I know since it’s a Beta version that will be corrected, so that did not affect my rating or enjoyment of this book at all. The reason for only 4 stars instead of 5 is because I felt the ending was very rushed and there wasn’t much build up to a certain shocker (which I am leaving out to avoid spoilers) but overall I thoroughly enjoyed this book, and can’t wait for the next book in the series! If you’re looking for a dystopian with romance, fantasy, and surprise all rolled into one, I recommend The Passage! I won this book thanks to Laura Kenyon over at Skipping Midnight (www.laurakenyon.com) when she hosted an interview of Jason Mott! Mr. Mott sent me an autographed copy, with a handwritten note inside also. He seems very cool, down-to-earth, and lives in the same state as I! The premise of this novel grabbed my attention immediately. People all over the world, returning from the dead, but not in a zombie like sense. What would you do, how would you react, if someone you love came back from the dead, locked in the time/age of when they died? Would you panic, and shut them out? Would you welcome them with open arms, just knowing it was really, truly, them? I would probably be freaked out at first, but I would want to cherish the moments that seemed like God giving me a fleeting second chance. This book shows the varying reactions and emotions of citizens in Arcadia as they start to see their loved ones returning from the grave. Harold and Lucille Hargrave are well up in years when their 8 year old boy, Jacob, who drowned in the river, returns home. The majority of this novel focuses on the Hargraves and how they are handling the situation, but there’s also little snippets of other Returned that were very interesting. One brief page showed Nazi soldiers that died in war, and returned to another war, only to die again. I felt the first 100 pages were very slow getting into, too much *stuff* that could have been left out, but by about pages 200 and on I was devouring this book, and cried at the end. (The Author’s Note made me cry as well!) I felt the ending was perfect. Mr. Mott did an excellent job of creating a small town southern atmosphere, complete with colloquialisms, faith in God, and a sense of community, be it with those who sided with the True Living, or the Returned and their supporters. Aside from the slow start, the only other issue I had (which isn’t really an issue, just a question) is why the the Returned come back? Was it just to have second chances with their loved ones? Or to remind others that life is short so make the most out of it? I didn’t catch that there was a concrete purpose for the Returned to actually return, but I still enjoyed this book! Thank you again, to Mr. Jason Mott for the opportunity to read this wonderful book, and to Laura for the chance on her blog! I recommend checking this book out ASAP! Also, Mr. Mott has a book coming out in September, The Wonder of All Things, that sounds equally fantastic! I really enjoyed this book. It is a dystopian, which I have been loving lately! It has elements of shock, romance, and fear all bundled into one. Basically, there is this exclusive arts school called The Forge School. The school is filmed and broadcast for the whole country to watch, with the option of focusing on certain students to give them more “blip ratings.” First year students have to go through a cut of 50 students, with the losers going back home. Most of the students come from lives that they don’t really want to return to. Rosie, the MC, lives in a boxcar with her mom, good-for-nothing stepdad, and little sister. She gets in trouble at school, which is actually a school/prison, and gets on the fast track to the penitentiary, with no options for college. Luckily for her, she is able to get her blip ratings up and has the opportunity to stay at The Forge School. But Rosie begins to realize not everything is as it seems. Students go to bed every night at 6 by way of a forced sleeping pill, on the terms that the sleeping enhancing their creativity. But once Rosie skips her pill she starts seeing weird things happening to her peers while they’re sleeping. At some points in the book I also began to question Rosie’s sanity. I began to think she was schizophrenic! O’Brien did an excellent job with making me feel right there at the school, or watching on the surface like on the show. I did have some issues with the book though. While it was captivating and the premise was very interesting, it fell short of 5 stars for me because I didn’t know when or where it was taking place until like more than halfway through! I like to have the tone set at the beginning. I could tell it was futuristic, but the specifics weren’t mentioned until much later on in the novel. Also, while it was set in the future, I felt like there were still things that dated the time period to now. They had normal cell phones and computers, for example. I figured you could have like, an implant in your arm for all that technology…or something more advanced…IMHO. Lastly, the ending was completely rushed and a HUGE cliffhanger….there better be a sequel! 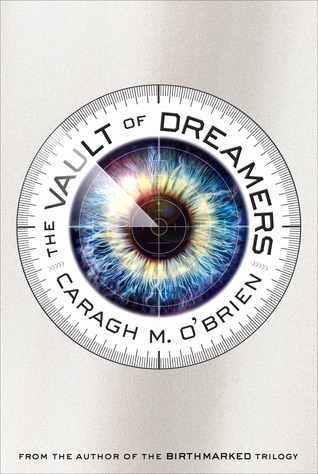 🙂 I definitely recommend you check this novel out if you enjoy sci-fi, fantasy, or dystopian. If you’re looking for a book that’s equal parts romance, suspense, magic, and twisted fantasy, I suggest this book! One of the booktubers I watch has been raving about this book and it was already on my TBR, so I decided to get it from the library, and I was not disappointed! 1- The cover. Awesome!! 2-A twisted retelling of Alice in Wonderland? I’m in! Alyssa is your average high school girl. She’s got a sworn enemy, Taelor, a huge crush on the boy next door, Jeb, and she loves to skateboard. Except for the fact that bugs and plants talk to her, and she’s a descendant of THE Alice…. 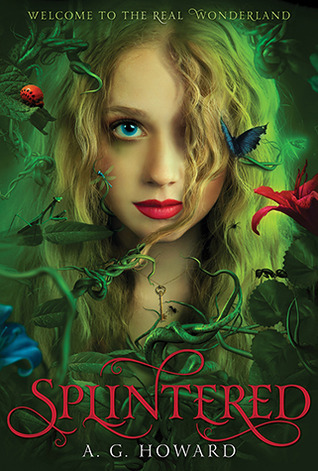 Splintered takes what you thought you knew of Wonderland and completely turns your world upside down. The White Rabbit is actually Rabid White…a skeletal grotesque creature! Alyssa’s mom is in a mental institution and after an extremely scary visit, Alyssa realizes she has to find Wonderland to save her mom, and the rest of her family. Along the way Alyssa remembers aspects of this place from her childhood dreams…but begins to realize not all is as it seems in Wonderland. Alyssa is a very likable, relatable MC who is torn between good and evil, with 2 dreamy suitors to choose from as well! We have loveable, loyal Jeb, and the deceitful, but beautiful Morpheus. And there’s Alyssa, a blend of both worlds. A.G Howard did an AMAZING job with detail and description. I really felt like I was surrounded by the creatures and plant life of Wonderland. A neat fact that I enjoyed, and felt kept everything tied together was the town Alyssa lived in, called Pleasance. Pleasance is actually the middle name of Alice Liddell, the inspiration behind Lewis Carroll’s story. There’s also lots of references to butterflies in the story, and you’ll see why that’s interesting once you read it! I can’t wait for the others in this trilogy! Ok. So. I was extremely excited to read this. In the beginning anyway. I borrowed the first 2 from a friend and for this last one, I was on the library hold waiting list for EVER! Once I finally got it, my hopes and dreams for all this book could be were crushed. Now, don’t get me wrong, it had it’s good moments. But there were so many things I felt were wrong about this book that I have to say…I just really didn’t like it. I hate to say that, but it’s true. It’s ironic that the preface states “Every question that can be answered must be answered or at least engaged. Illogical thought processes must be challenged when they arise. Wrong answers must be corrected. Correct answers must be affirmed.” (From the Erudite faction manifesto.) Is that a joke? This whole book was an illogical thought process! I felt there was so much action packed into the book only to fall apart and crumble into shards of nothing-ness and confusion. The build up didn’t build up to anything. I felt the terms of the future of Chicago weren’t believable after all that has happened! I just felt the majority of the book was unrealistic. There was also so much information thrown around concerning the Bureau and all that, but my eyes were glazing over because it was so confusing and too much to grasp all at once. Overall, I’m glad I finished the book, resulting in the 3 stars, because I did want to know the ending of the trilogy, and I honestly loved the first two books, but I didn’t get the resolution from Allegiant that I felt should have happened.